Americans who own stocks are much more likely to have a favourable view on what President Donald Trump has done to the economy, according to a Public Policy Polling survey. That’s a far more optimistic reading than the one put forth from respondents who don’t own stocks. Just 24% of those in the group said their economic situation had improved, according to PPP. Twenty-nine per cent said their personal circumstances had worsened. The disparity in the survey results shows just how big of an impact the stock market’s torrid postelection rally has had on the psyche of Americans fortunate enough to ride the wave. The S&P 500 has surged 25% since Trump’s victory in November 2016, creating $US5.6 trillion in corporate market cap – blockbuster numbers by any measure. 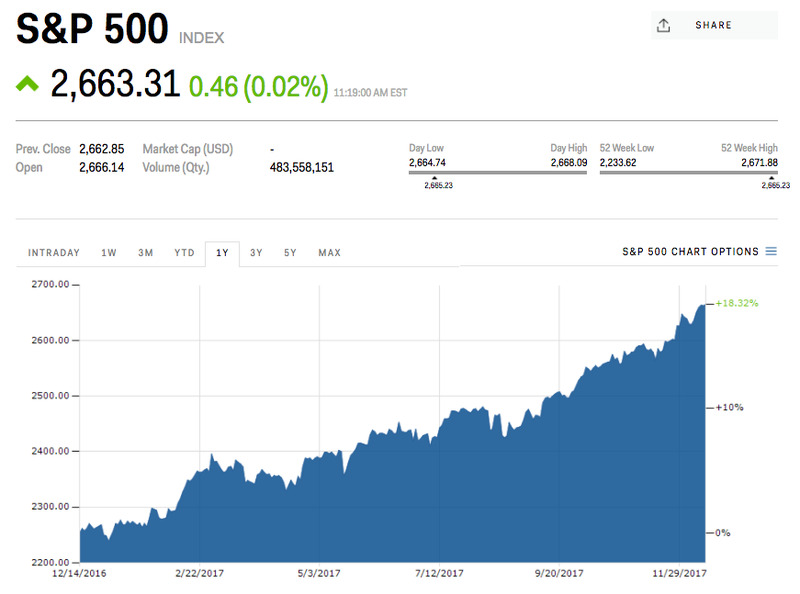 The majority of equity strategists across Wall Street are calling for the S&P 500 to continue rising through the end of 2018. So even though stocks look expensive, they could still be a good investment. And who knows; maybe it will even improve your perspective on Trump’s economy. Markets InsiderThe S&P 500 has surged 25% since Donald Trump won the presidential election in November 2016.